I set out to make a film to save sharks, and I’m in way over my head. Because it’s not about sharks, it’s about us. I found out we have a decision to make, and we don’t have much time. Bringing you some of the most incredible wildlife spectacles ever recorded, audiences are brought face to face with sharks and cuddly lemurs, into the microscopic world of the pygmy seahorse, and on the hunt with the deadly flamboyant cuttlefish. From the coral reefs in Papua New Guinea to the rainforests in Madagascar, Stewart reveals that our fate is tied to even the smallest of creatures. Through it all, Stewart’s journey reveals a massive opportunity, as activists and individuals all over the world are winning the battle to save the ecosystems we depend on for survival. 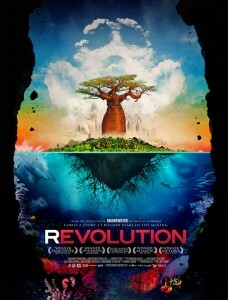 Presenting the most important information on human survival and inspiring people all over the world to fight for life, Revolution is essential viewing for everyone. Startling, beautiful, and provocative, Revolution inspires audiences across the globe to join the biggest movement in history that’s rising to the challenge of saving our world.